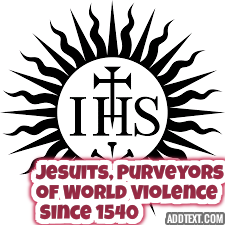 The UNITED STATES is ran by Jesuits and Zionists which is a violation of the 1810 Titles of Nobility Act! • “Do not let the forces of evil takeover, and make this a Christian America.” - Jew Senator Howard Metzenbaum, November 6, 1986. • "The wealthy Jews control the world, in their hands lies the fate of governments and nations. They set governments one against the other. When the wealthy Jews play, the nations and the rulers dance. One way or the other, they get rich.” - Theodore Herzl, the Jewish founder of Zionism, in an interview with Deutsche Zeitung. • "The difference between a Jewish soul and souls of non-Jews, all of them in all different levels, is greater and deeper than the difference between a human soul and the souls of cattle." - Rabbi Kook, the Elder, father of the messianic tendency of Jewish fundamentalism. There is no "money" in circulation. The Federal Reserve stole all of it with the creation of Roosevelt's New Deal in 1933. With the Rothschild designed crash of the stock market in 1929 there ensued a run on the banks and the people demanded the return of their gold, which had previously been promised under the Federal Reserve Act of 1913. But the banksters wouldn't have it. In 1933 with Roosevelt's Proclamation 2039 We The People became an enemy of the state and were placed under military authority, being forced to turn in all our gold. Every dollar printed and LOANED to our government by these criminals carries a tariff. A fee that can only be paid with more pieces of paper backed by nothing. It is an endless pit of debt that we will NEVER be able to climb out of. U.S.has long been run by a Jesuit - Zionist Military Industrial Complex that goes about destroying other countries as they destroyed The United of America fifty Free and Independent Nation states all of which have been enslaved and are under foreign control managed by Crown BAR agents! U.S. has red hands from the overthrow of virtually all nations since the 1860's for the Jesuit - Zionist NWO! Much of the money we pay in goes into special administrative and investment funds. The overall larges funds in the US are called Fiduciary (Investments) and Enterprise (Day to day operations).. 70 years ago laws were passed in state, cities and municipalities that money that goes to investments may not be used to balance any budget deficits! The money invested, gains interest and is funneled to the wealthy elite and onto the Vatican and City of London for their pleasure! The Greatest Scam Ever; We're Not Broke, Far From ItIn "Big Brother"
The Corporation of the UNITED STATES OF AMERICAIn "Big Brother"
Revisionist History #3; Owners of Empire: the Vatican, the Crown and the District of ColumbiaIn "Big Brother"